It will be providing airplane food. Emirates Flight Catering and Crop One Holdings announced plans this week for what would be the world's largest vertical farm, to be based in Dubai. This is another one of Crop One's vertical farms, which don't use pesticides and are more water-efficient than their soil counterparts. 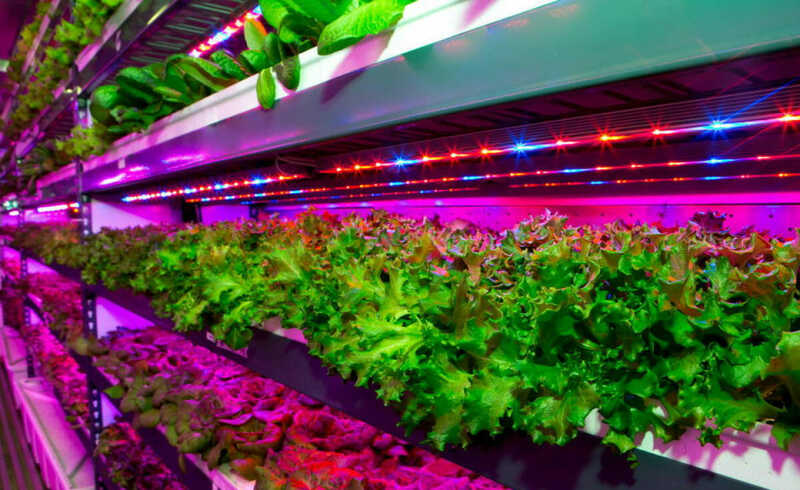 Vertical farms – indoor facilities in which crops are grown in hydroponic systems stacked on top of each other – are ideal for all kinds of situations. Old, abandoned urban factories make for nice vertical farms. But they might be best suited for environments like the United Arab Emirates, where arable land is limited but sunshine, which can be used for clean energy, is nearly limitless. Emirates Flight Catering and Crop One Holdings announced plans this week for what would be the world’s largest vertical farm, to be based in Dubai. The facility will span 130,000 square feet, which makes it nearly twice as large as the previous (planned) champion, based in Newark, New Jersey, just outside New York City. Vertical farms have lots of advantages. Being indoors, they aren’t subject to seasons and can produce year-round. And being locked off from the outside world means that they typically use zero pesticides. The downsides lie primarily in water and energy use. Most vertical farms use hydroponics or aeroponics, soil-free methods in which nutrients are dissolved in water and circulated into a plant’s bare roots. And with proper engineering, water can be easily conserved. In fact, Crop One says it will use 1/2500th the water of an equivalently sized soil operation. Energy is a little trickier, as the plants still require light. LEDs are fairly energy-efficient, compared with older lighting systems, but you need an awful lot of them. One way to counteract the large energy footprint of vertical farms is to set up a clean energy source. Crop One told CNN that it will be using a mix of power grid energy and solar; Dubai does not currently get very much of its energy from solar power but has announced ambitious plans to ramp up solar power in the next few years. Its target by 2050: 75 percent of Dubai’s energy will come from solar. The Crop One facility will primarily grow greens, which do very well in systems like this and aims to harvest 6,000 pounds of greens per day. Those will be going, not surprisingly given its co-owners, to in-flight and airport lounge meals starting in December of 2019. Crop One has not announced plans to grow anything besides leafy greens, but more variety is certainly possible; squash, peppers, and some fruits (like strawberries) have proven able to handle vertical farming.